The card I am going to share with you today is inspired by two challenges. The first one is the Mojo Monday Sketch 194. The second one is the Stampin' Sisters in Christ Challenge 92: Use something new on your project - it can be a new product, technique, embellishment - even a colour combo that is new for you - show us what you got!! Well, I have plenty of new stuff to choose from so I new this challenge would be super easy for me. It was tackling the sketch Julee designed that concerned me the most! I new that I wanted to get a start on my Christmas cards since I am always waiting until the last minute and then never getting them done! So, I pulled out some supplies that I had never opened and put them to work. Thanks for stopping by today. I hope you like my card but more importantly I hope I have inspired you to get a head start on your holiday cards and to use some of that stuff you have that is still in the packaging. I know you have some! Lovely Jennipher! I saw that sketch and was wondering what to try for the papers. Love that you made a Christmas card. I have made a couple. 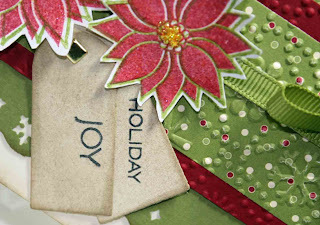 I am finishing up my Christmas LOs and then will use the extras. 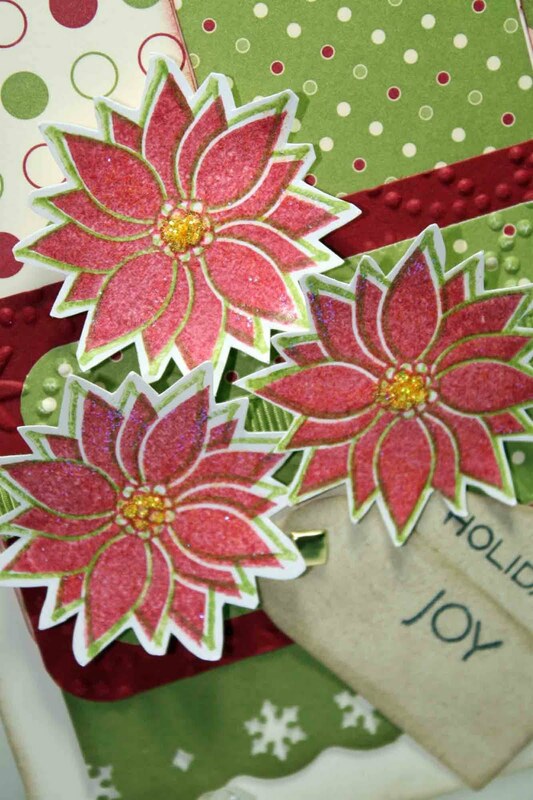 LOVE your poinsettias! Stunning card, I like the sketch and what you did with it. This is a beautiful Christmas card Jennipher! I love everything about it...TFS!!! Your Christmas card is gorgeous! Love all your new supplies, and you sure put them to good use. :) I love what you did with the sketch. I am having trouble with it, I'll admit. You have inspired me to give it a go. What a gorgeous Christmas card, with those poinsettias, just lovely. The combo of the paper and colors are so pretty and what a great job with the sketch. I cannot do sketches, I just freeze up, but just love how you did this one. 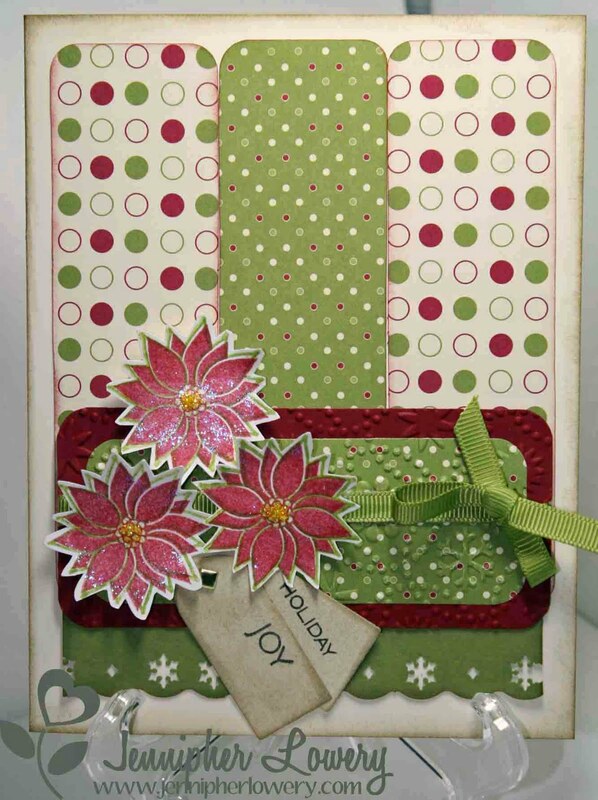 This is beautiful, Jennipher...I love the colors and the flowers and ribbon are gorgeous! I only have one word.... GORGEOUS! GORGEOUS! GORGEOUS!!! Love everything about this!!! Thanks so much for joining us at Stampin Sisters in Christ! What a GORGEOUS take on this week's Mojo sketch! Loving your Christmas theme and the flower trio! They look so shimmery! Great Christmas card. Oh my, it is that time of year again isn't it. I'm not ready... I haven't had any summer yet. Beautiful card! I love the cut out poinsettias. I think you did a wonderful job on the sketch. Congrats on getting a start on your Christmas cards. What a beautiful Christmas card! The poinsettias are so pretty. Beautiful holiday card! Your poinsettias are lovely. Thank you for all your wonderful comments. Simply beautiful! Thanks for playing Mojo Monday! This is absolutely gorgeous, I love it right down to the sentiment across two tags! WOW! 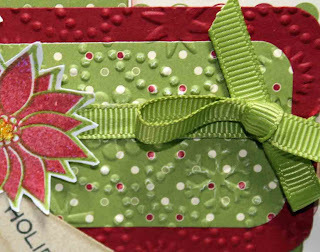 Your cards are made so intricately! This is a stunning Christmas card.